As one of this country’s oldest and most important cities, Baltimore, Maryland has long played a critical role in the American economy. Lying at a major intersection between the South and the Northeast, the town rose to prominence as a major center of trade and industry. Today, it serves as a hub for car and truck handling, bioscience research, and countless other thriving industries. ExpeditedFreight.com caters to the supply and delivery needs of all these industries, helping the Charm City continue to play a prominent role in American life. Baltimore’s main claim to fame is its port, which generates hundreds of thousands of jobs and billions of dollars in income for the city and all of Maryland. The Port of Baltimore is notable for being the leading hub for handling cars, trucks, and other vehicles. This has in turn given rise to auto parts suppliers and other companies that keep these vehicles in good condition. Unfortunately, Baltimore’s auto handling and maintenance industries have trouble getting the supplies they need to deal with all of the vehicles shipped into the city. Between the nearly 3 million people living in the Baltimore metropolitan area and the town's proximity to DC and Philadelphia, the roads are subject to severe traffic. As a result, carriers have trouble getting supplies to these businesses in time to meet their needs. These difficulties are only exacerbated by the fact that vehicles are shipped into and out of Baltimore on tight schedules, as well as the fact that the parts they’re bringing in cannot afford to be damaged on the road. As an expedited freight company that serves clients from the automotive industry and dozens of other fields, we deliver into and out of Baltimore. 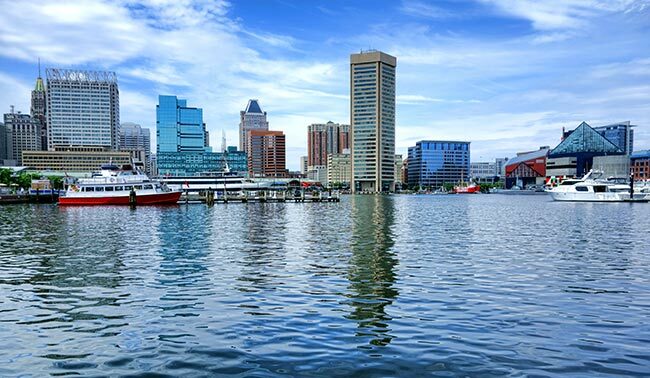 We also serve all of the communities within the Baltimore metropolitan area and many within neighboring metropolises, including Frederick and Annapolis, Maryland; Dover and Wilmington, Delaware; and Washington, DC. When shipping into or out of the Baltimore area, ExpeditedFreight.com offers dedicated trucking services. This means we don’t make you share your vehicle with anyone else, instead devoting it entirely to your order. We can thus complete the delivery more quickly, and we have less trouble accommodating any unique preservation needs that you may require. We also assign teams of two to drive these trucks, ensuring that the drivers are fully rested and can keep your goods safe. Whenever we send one of these trucks out on the road, we come up with a detailed plan to guide it to your destination. We then track the truck while it is traveling, looking out for signs of delays and guiding it around any obstacles. If a truck breaks down, we can dispatch a replacement vehicle from any of our coverage areas in major cities throughout Canada and the United States. In this way, we keep your orders on schedule no matter how difficult the circumstances. For more information on expedited trucking services in the Baltimore area and beyond, contact ExpeditedFreight.com at (443) 998-0800.